I've said it before and I'll say it again- I've found motherhood, to my utter surprise, to be the most liberating thing I've ever done. I don't mean that I use Paloma as an excuse to be bigger in the world. I do mean that somehow, a change has taken place in me that causes me to Just Quit Worrying So Damn Much about what others think, and to just be happy. People moan about "losing their freedom" if/when they take on parenthood, but for me, it has more to do with all the demands of the world outside parenting. Again, I *never, ever* would have imagined saying this, but the truth is I would rather care for Paloma than do anything else. I don't feel like I'm losing my freedom when I'm with her. I feel like I'm losing my freedom when I feel obligated to the outside world. So if the phone rings, screw it. The Urgent Message from Craptastic Credit can wait. And if the emails pile up, well, they can wait too. I'm a little more hesitant to say "screw it all!" 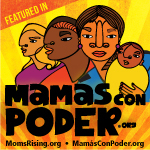 Because I do feel responsibility for other things I'm doing in my life-- namely, (and ironically) work for Moms Rising. And I do follow through. But it is deliciously freeing to say, at least for today, I'm taking time for myself! I'm taking time for Paloma! I'm going to enjoy this life!